Being dumb is not a kiss of death for a movie, at least not necessarily. There are plenty of dumb movies that manage to be highly entertaining thanks to some combination of a good cast, a talented director, and a charismatic dedication to fun in spite of any silliness of the story. Roland Emmerich is a director who has experience on both sides of that fine line. While something like the 1998 American Godzilla is basically terrible no matter how you look at it, Independence Day is just silly enough to be fun despite the nonsensical nature of the story. 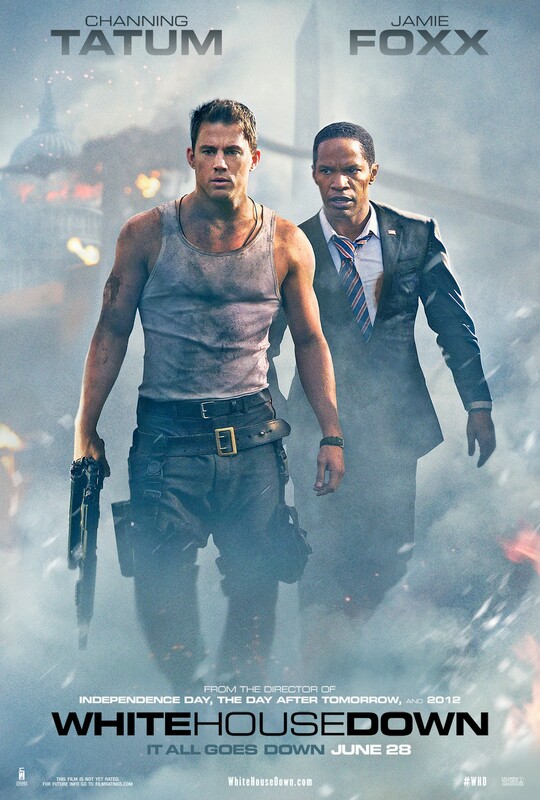 Emmerich’s newest film, White House Down, consistently straddles that fine line, veering regularly between just fun enough to work, and just dumb enough to be frustrating. White House Down tells the story of John McClane Cale, a former New York City cop soldier in Afghanistan, who is struggling to rebuild a relationship with his estranged wife daughter. Emily, his daughter, is passionate about politics and is a huge supporter of President James Sawyer, who has recently announced his plan to pull all US troops out of the Middle East and begin peace talks in that region. In an attempt to impress his daughter, John brings Emily along with him to the White House for his job interview with the Secret Service, but while they are there the White House is attacked by a group of terrorists. Yes, it’s the well-worn “Die Hard in a…” pitch, this time with the blank being filled in by the White House. * Channing Tatum strips down to an undershirt and talks sarcastically to himself, he spends a fair amount of time climbing around in elevator shafts, the terrorists have a multilayered scheme that at least partially involves stealing large amounts of money, and there’s even a bit of the buddy cop aspect of Die Hard with a Vengeance between Channing Tatum and Jamie Foxx. And, to be honest, as a low-rent Die Hard, it actually sort of works. It spends about a half-hour right up front on eye-rolling forced sentimentality, and then it throws any ounce of logic or intelligence right out the window when six guys take all of five minutes to kill dozens of armed guards and hold hostage one of the most protected buildings in the world, but after that the movie settles into its groove and starts getting fun. As far as Die Hard knockoffs go, this is one of the better ones; it’s not nearly as good as Die Hard with a Vengeance (let alone the original Die Hard), but it’s far better than the actual Die Hard sequel we got earlier this year. Jamie Foxx and Channing Tatum are both very funny and have good chemistry together, the scheme of the villains – while mostly nonsense – is sufficiently interesting so as to keep you invested, and the action is well executed and fun. It also successfully breaks up the action by using characters on the outside to do the heavy lifting when it comes to progressing the story and helping to uncover the terrorists’ motives. The film even takes the effort to set things up earlier in the story that pay off later. Granted, most of these are telegraphed with the subtlety of a brick to the head, but when most summer blockbusters can’t even manage basic setups and payoffs like this, it’s worth noting. The problem is, after about an hour or so of being Die Hard in the White House it stops being that. At a certain point, the action escapes the confines of the Executive Mansion and the scale of everything is increased dramatically. This is where the movie starts to lose itself. Roland Emmerich is sort of infamous for repeatedly blowing up the world in his films, but here the action inside the White House is much more restrained and offers opportunity for character moments and storytelling, even if the story is silly. It’s fun and it works because it’s restrained. However, once the inherent limitations of being stuck inside the White House are removed, Emmerich is free to go crazy, and go crazy he does. You have massive aircraft blowing up, helicopters flying through the streets of Washington, D.C., missiles launched, cars chasing, tanks, etc. It’s all big and loud and exciting, but it doesn’t have any focus; it just ends up being a whole lot of visual noise (and the regular kind of noise as well). By the time it all ends the movie has completely burned through any goodwill it established during the earlier, more restrained segments, and has more than worn out its welcome. Another thing I want to briefly touch on is the fact that this movie is extremely left wing, I mean surprisingly so. Typically summer blockbusters are pulled this way and that by studio folks to iron out any wrinkles that might offend people, but this film makes no effort to hide its stance that the left wing of politics is a shining beacon of hope for mankind while the right are, at best, a bunch of violent dimwits, and, at worst, conniving, mustache twirling, villains. The idea of the right wing invading the White House, trying to kill the President, and start war with other countries isn’t at all subtext. In fact, I’m pretty sure a character says essentially that, directly to the camera. As for how I felt about it, I didn’t really care either way. The whole things done in such a brain dead fashion – lacking any nuance or ability to provoke thought – that I couldn’t muster up any sort of feeling on the matter beyond an eye roll. That being said, if the movie’s politics sounds like it’d get you worked up, you’re probably better off opting out (though, opting out may not be a bad choice even if you wouldn’t be bothered by that). I suspect this will cause a minor stir on one or two of the conservative talk shows, but that’s sort of unfortunate because the movie is neither smart enough nor fun enough to deserve the attention. White House Down is just fun enough to be a movie you can enjoy in the background as your doing something else, but not one that’s really worth dedicating your full attention (or $10) to. The middle section of the movie is by far the most entertaining, and really not bad in it’s own right, but the forced sentimentality and the exhaustive, unfocussed action that bookend it make it hard to recommend. Besides, if you’re really looking for a movie that has fun with the Die Hard formula, you’re better off just watching Die Hard. *For the record, I never saw Olympus Has Fallen – the other Die Hard in the White House movie that came out this year – so I can’t comment on how it compares to this one.